How should a piece on internet meme culture start? Like a college-grade paper with a Webster definition of the word meme? The fact of the matter is that unless you have been living under a rock for the past decade, you probably already know what memes are. If not, you should start learning about internet culture immediately. After all, alongside viral potential, memes are the second most important topic of discussion when it comes to offbeat social media marketing practices and strategies. It’s sauce. Raw sauce. It’s just that. Whether it would be McDonald’s Szechuan Sauce that gets the fans of a popular TV cartoon raging, or the sarcastic attempts of freestyle of a comedian rapper, memes are born out of real life events or simply due to a mishap of someone’s creativity. The debate on how or why such humoristic trends become popular is still ongoing and there isn’t a scientific consensus on the psychological factors that come into play. The fact of the matter is that memes are an integral part of Internet culture. And in their attempts to be more relatable, brands are slowly starting to realize the potential of using memes has on social media. It should be noted that the use of humor in this matter might be a double edged sword. If not implemented correctly, a meme integrated within a marketing strategy might result in a harmful association with the brand name and end up hurting the brand itself. This is primarily due to the fact that misuse of memes in itself is being looked down upon by the internet culture. Combined with the fact that there are individuals who dislike the integration of marketing on social media via the use of memes, and the reason behind the decision by most brands of not using memes becomes rather obvious. Yet, those who manage to implement the strategy correctly do reap some amazing benefits including a bigger brand reach and better social media engagement. For example, we’ve mentioned Wendy’s amazing social media moves multiple times in some of our previous analysis of the social media networking industry. One of the first mistakes most social media marketers do is to have a black and white outlook on meme culture. You are either using it, or you aren’t. And on the surface, the implementation of completely humanized content might not seem the best choice for most brand profiles. 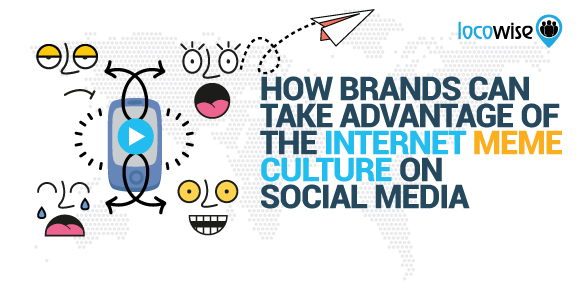 After all, as much as brands need to be relatable on social media, they also need to retain a level of professional exposure. Imagine Samsung posting a silly “the thing goes skrra” meme in a video about its exploding Note 7 phones. It would be an insensitive response that will anger its audience and the people affected by the Note 7 debacle. But as aforementioned, such examples come from a rather narrow outlook on memes and the overall internet meme culture i.e. the idea that memes are just silly jokes. Instead, if you want to implement them within your marketing strategy, you should rather consider memes as a means of communication. The best way to think about memes is to think about them much in the same way you would consider using unofficial millennial and generation Y slang, such as “lit,” “low key mad” etc. And in the same sense, memes are much of a slang. Just one that often incorporates visual imagery. Most memes do express a certain emotional feeling. So, for example, next time you are angered at something that’s happening within your industry, why not post a passive-aggressive post accompanied with a photo of Arthur’s fist? An important factor that comes into play in the decision making process of how to use a meme is knowing the value that it brings to a conversation. Much like you’d have to be aware what is considered to be “lit,” you should have an idea of what a meme represents, before using it on your brand’s social media accounts. Once you’ve been involved with a few memes, you’d probably be able to understand the nature of one just by looking at a few examples of how it’s used. If not, you could use different online platforms that allow you to understand the meaning and the origins of a meme. But chances are, you’d be better off using memes only once you are able to personally understand their value. This is primarily due to the fact that an over-engineered meme, much like an over-engineered sentence aimed at millennials or generation Y, can backfire. One of the biggest problems that might arise with the use of a meme, following misuse, is related to time and relevancy. The flow of memes is rather fast and memes tend to change almost each and every day. In fact, only a few of the dozens of memes that are used online end up having a lifespan of over a few weeks. Thus, an integral part of a successful meme-based social media strategy would be the timely integration of popular memes. The easiest way to think about it would be to compare it with the news cycle. Much like a news network or other media related to the news should post content on social media that is relevant to the news cycle, you should only post memes which are timely and relevant. This will help you take the most advantage of the post, due to the fact that when a meme becomes popular, people are more engaged with it, than once it becomes irrelevant to the current flow of the memes in the overall internet culture and meme cycle. Another item you should take into account is the popularity of a certain meme. While all other factors do also come into play, misjudging how popular a meme is can harm your strategy significantly. This is primarily true for memes, which seem to be rising in popularity, but end up falling out of the cycle. Thus, instead of trying to be on the cutting edge, you should rather consider finding the sweet spot at which a meme is just popular enough, yet still relevant, before using it. Also, when planning ahead, make sure not to schedule meme posts for more than a week or two ahead, as they do tend to, as aforementioned, to lose their power after a certain period of time. Having a successful content management strategy for a certain social networking platform is arguably the most difficult part of social media marketing. You’d have to take into account your audience, relevancy, industry-specific content and much more. But for the most part, any strategy comes down to trial, error, success, looking at the analytics and adapting. As aforementioned, we’ve discussed how creative marketing strategies can skyrocket your social media brand to new heights before. In fact, we’ve even mentioned memes a couple of times. But to further state the point of how effective a meme can be, we decided to give you an example from Burger King. Often joking about relevant matters, such as their tweet regarding the 280-character Tweet limit Twitter change, the fast food brand manages to integrate humor and humanizing elements quite well. And this tweet is a perfect example. A text based take on the popular “I Bet He’s Thinking About Other Women” meme, the tweet shows just how powerful meme use is, especially on Twitter. The analytics show a clear picture. 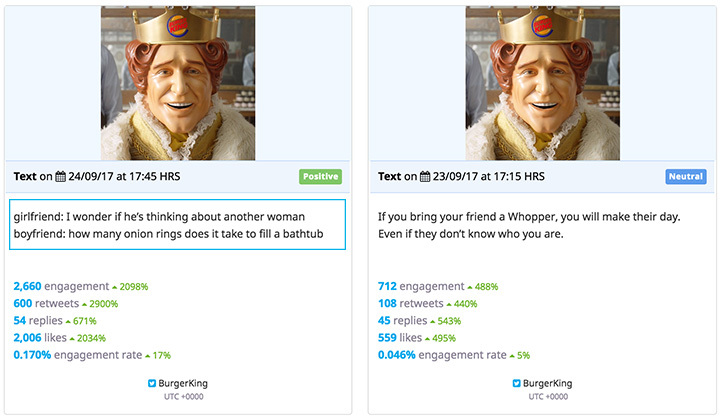 Despite the tweet (text-based) meme dropping to a 0.15% ER (half the 0.31% ER average for the Burger King Twitter account) due to its increased reach, it was one of the most retweeted and engaging tweets for the previous month posted by the brand. In fact, it was the third most popular tweet for the whole month. And, of course, if you are going to implement a meme-based marketing strategy to your brand on social media, you should keep a close eye on the analytics. At times, even if the meme-based content helps you with an increased engagement, it might not serve a purpose for audience growth. What’s more, if your meme-based posts receive the attention, while your other posts have little to no engagement, you might reconsider the amount of memes you post or adapting your other content to a new strategy overall. Thus, if you want to have all of your social media analytics in a nice, easy to use and analyze manner, make sure to sign up for a free 7-day trial of Locowise today. We hope we’ve inspired you with this post.